The Fish Forever Progress Update is a regular communication to supporters and stakeholders on the advances we're making on the ground, the challenges we're working to surmount, and the learning and adaptive management we're doing along the way. In Fish Forever Progress Update #6 (October 2016), Strait to Impact introduced the launch of “Fish Forever Flex”, an alternative coastal fisheries delivery model being tested in the Tañon Strait (the Philippines’s largest protected seascape). As part of the United Nations Development Program/Global Environment Facility SMARTSeas Philippines project and Bloomberg’s Vibrant Oceans Initiative, Rare committed to building and testing this new model at regional scale, partnering with local to national government agencies to strengthen the Strait’s marine management and protection. Rare partnered with the Department of Environment and Natural Resources to select sites and strengthen provincial decision-making; with regional-level marine conservation authorities, including the Strait’s Protected Area Office and the Executive Committee of the 350+member Protected Area Management Body, to enhance organizational development and financial planning and clarify the seascape’s policies; and with communities and local governments in 22 of the Strait’s 42 municipalities to run local and regional campaigns that targeted specific fisher and local government behavior change and strengthened management of 17 local MPAs. Although this 18-month intervention concludes in March 2018, Fish Forever has already begun to evaluate the new model’s outcomes. A sampling of results, insights, and lessons learned follows. While Fish Forever Flex was only applied in 22 of the Strait’s 42 municipalities, strengthening and clarifying the complicated regional governance and institutional structure has benefited all 42 sites and Strait-wide decision-making. Over the last year, Cebu Province (the only one of the Strait’s three provinces unaligned with the Protected Areas Act requirements) has restructured into three mini protected area management bodies to more effectively represent local fishers and stakeholders. Enabling more effective regional-level policies motivated local decision-making. To be in line with the Act, local ordinances and policies must be approved at regional level. 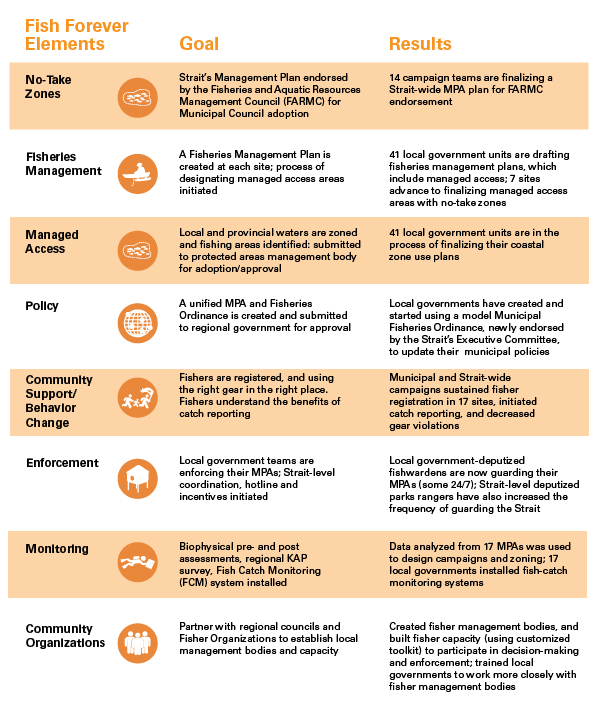 Rare conducted an inventory of local ordinances, and used the analysis to help municipalities create the first standardized policy template—now approved and endorsed by regional government and used by local government to craft policies on MPA management. Fish Forever Flex strengthened local government capacity to manage small municipal MPAs. For the first time, local governments are preparing individual Coastal Zoning and Fisheries Resource Management plans (CFRM) in line with the Strait’s 10-year General Management Plan. Completion of these CFRM planning workshops in the Strait is a historic accomplishment; declared as a protected seascape 19 years ago, this is the first initiative towards a Strait-wide delineation of multiple-use and strict protection zones for all the 42 local governing units that surround it. This planning—in addition to new capacities built, such as fish catch monitoring and training—makes local governments more equipped to contribute to the Strait’s Plan and align their management goals with the Plan’s five major objectives. Based on experience from Fish Forever’s first programmatic phase (2014-2017), Fish Forever Flex focused on improving local governance and management while decreasing costs of the intervention by working within one region (the Strait) and leveraging resources from national and provincial government delivery partners, among other changes. Analysis of program impact and cost reduction will be conducted as part of final program analysis. Strengthening governance within local and regional government institutions—and connecting the small MPAs within the Tañon Strait to align with Strait-wide policy and management—was necessary to start improving the Strait’s management plan. Designing a participatory management process and partnering with local to national institutions was critical for buy-in, impact and sustainability. This approach built the capacity of Fisher and People’s organizations to manage municipal resources, coordinate with the Strait’s Protected Area office, and align with the Strait’s General Management Plan. Rare’s two-pronged approach—running one regional (Strait-wide) campaign and multiple municipal campaigns that targeted key influencers, government leaders, and fishers, and developing robust toolkits to train stakeholders (e.g., with knowledge about why the Strait should be protected as well as awareness of the Strait’s regulations)—seemed to have had a strong influence on advancing local to regional policies and governance. As the program works to scale efforts across multiple communities and regions, managing government and community’s expectations for program results will remain a challenge. Five of the 22 municipalities that were formerly part of Fish Forever’s first phase had already established strong infrastructure for implementing managed access and no-take zones. This uneven starting point created unrealistic expectations for what the other 17 local governments could newly hope to accomplish within 18 months. Ensuring that co-delivery partners assume future implementation costs and effort will remain key to sustainable coastal fisheries reform. In a train-the-trainers model, primary stakeholders, including representatives from the Department of Natural Resources, Bureau of Forestry and Aquatic Resources, the three provinces of Cebu, Negros Oriental, and Negros Occidental, and three municipal alliances, received targeted training to understand the tools and methodologies that fishers and local governments used for coastal fisheries management, and encourage collaboration and networking (and future replication of the model) among local governing authorities. Implementation of Fish Forever Flex has evolved Fish Forever’s program model to geographically cluster intervention sites, strengthen and enable policy and governance at concentric government levels, and concentrate program implementation at regional level (i.e., in Indonesia’s West Papua and Southeast Sulawesi provinces, in Brazilian states of Pará and Pernambuco, through provincial selection in Mozambique, and in regional strategy design in the Mesoamerican Reef countries of Mexico, Honduras, Belize, and Guatemala). Globally, Rare staff are closely monitoring the results of this intervention to understand how to contextualize the new model within their respective countries and advance the pathway to scaling the solution nationally. To learn more, visit the following links: Rare Philippines, GRID Magazine, SMARTSeas PH Facebook, and Tañon Strait Partnership. In November 2017, the Mozambique’s Ministry of Sea, Inland Waters, and Fisheries revised Fisheries Law 23/2013 to approve new regulations for Mozambique’s fishing rights and licensing. This decree, which introduces fishing rights for the first time in Mozambique, is part of a ministerial effort to harmonize all fisheries regulations with the Fisheries Law1. To align with establishing managed access areas, Fishing Rights for Artisanal Fisheriesshould include privileged access to a fishing area (Article 6(e)). To minimize open access, fishing licenses should contain area(s) where the fishing activities should be carried out (Article 9(f)). To ensure that subsistence fishers responsibly steward their resources, fishing rights are provided for subsistence fisheries through registration of fishing gears, subject to the fisheries management measures under implementation (Article 10). While helping to support such enabling policies for sustainable coastal fisheries reform, the Fish Forever Mozambique team, in partnership with the government, has also advanced program implementation: established six fisheries management bodies within local councils (CCPs), which have already been recognized by local government and the communities they represent (the legal framework of five have now been approved); designed six behavior change and social marketing campaigns (to be launched early in 2018); and enabled participatory workshops that shared biological and social (household) data collected and consolidated local knowledge necessary for proposing new managed access and reserve areas. Further, moving program offices to a new location in Maputo (no longer housed within the Institute for Development of Fisheries and Aquaculture (IDEPA)) reflects the national to provincial-level program and partnership restructuring that will better facilitate a regional intervention. Lastly, the program is also expanding due to grant agreements with the Swedish International Development Cooperation Agency, the Swedish Postcode Foundation, and the Blue Action Fund/KFW (which complements initial funding provided by the Nordic Development Fund) and will allow for replicating Fish Forever beyond the six initial pilot sites. 1. Fisheries Law 23/2013 establishes the legal framework for fishing (and related activities) and protecting Mozambique’s marine resources. As reported in Fish Forever Progress Update #8 (March 2017), Rare and partners celebrated Indonesia’s first network of managed access fishing areas, based on customary laws, in Raja Ampat, Indonesia. Since then, Rare and The Ministry of Maritime Affairs and Fisheries, the District Government of Raja Ampat, Foundation Nazaret Papua, Conservation International, and the Adat Council of Raja Ampat, with support from the USAID Feed the Future Program, have worked with 510 fishers, village, religious, and customary leaders and elders and local governments to operationalize the managed access system for the bay’s shrimp, sea-cucumber, Indian mackerel, grouper and blue swimming crab fisheries. In November 2017, Rare assisted the indigenous communities to finalize the Bay’s first general Customary Fisheries Area management plan and standard operating procedures (SOPs). 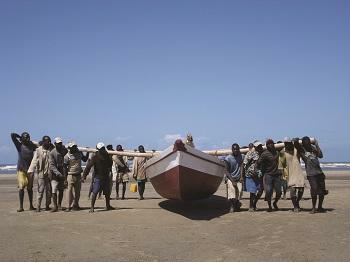 The plan and SOPs—which were created collaboratively by Mayalibit Bay’s indigenous customary owners and encompass 12 villages of the 53,000-hectare Mayalibit Bay Marine Conservation Area— are designed to increase fish catch, rejuvenate fisheries’ customary practices, and mitigate fishing conflicts among villages. The Bay’s 12 individual customary management plans entitle village communities exclusive access over their fisheries resources. To achieve the plan’s objectives, Mayalibit Bay’s key stakeholders are working to strengthen indigenous village institutions, monitor customary fisheries areas’ fish catch for decision-making on harvest control rules, and revitalize surveillance and enforcement through collaboration between legally-ordained Fisher Management Bodies and the district government technical implementing agency (UPTD-BLUD). Importantly, the general management plan includes each village’s newly-developed and customized fishery regulations, which include input controls on fishing gear use and boat size; output controls on fish size limits; short and long-term habitat closures, and access restrictions on fisher entry. Further, each fisher recognizes the importance of recording fish catch, and Rare is working with fishers and local governments to transition paper-based recording systems into digital catch collections – data that will be utilized by the Customary Maya Tribe of Raja Ampat’s Board, Raja Ampat’s Department of Marine Affairs and Fisheries Head, the UPTD-BLUD Raja Ampat Head, and Fisher Management Bodies for management decision-making. Lastly, RARE plans to integrate OurFish with the District Fisheries Agency’s fisher and vessel registration to unify fishers, buyers and government agencies in real-time fisheries management. 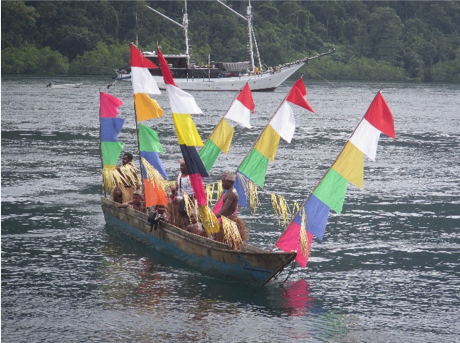 Rare is testing the extent to which the Raja Ampat success and approach can be replicated in neighboring Dampier Strait, and represent a model of small-scale, indigenous resource management that harnesses contemporary sustainable management practices. Upcoming visioning workshops, learning exchanges and engagements on the technical design of managed access boundaries are planned for February 2018. Since 2012, Rare, through Fish Forever, has collaborated with over 450 fishing communities of 55,000 fishers and nearly 100 partners across five countries2 to put each country on the path to community-based coastal fisheries reform. While data from Brazil, the Philippines, and Indonesia is being analyzed, Rare has been building on the foundation of this body of work to develop a regional approach to rights-based fisheries management (through managed access paired with reserves)—one that targets behaviors changed across concentric levels of government, harmonizes regional marine policy as a framework for implementing at scale, and builds governance capacity at a local level, networked to be regionally effective. While a regional approach will form the basis of program implementation within Rare’s current countries of work, it will also be tested as a municipal network model linking local government to national and regional strategies for ecoregion management. Together with new partners, including the Smithsonian Institution, Centre for Marine Studies (CEM), and The Summit Foundation,Rare will align with ongoing efforts to establish effective marine reserves and fisheries management in the MAR. 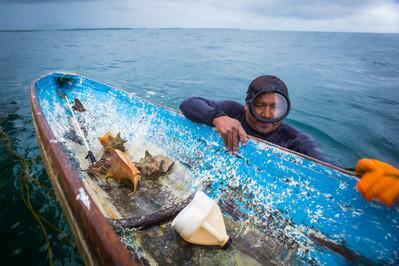 Recognizing that ‘managed access’ of coastal fisheries has already been implemented in Belize for commercially-important fisheries, and delivered at discrete locations in other parts of the Mesoamerican region, we are currently in the process of building a coalition of parties that will leverage collective experience to continue advancing effective marine resource management in this biodiverse region. Rare will connect lessons learned and tools developed from Fish Forever sites around the world and the alternative delivery model Fish Forever Flex (see Story #1), as well as innovative technology tools such as OurFish to support national partners in their ongoing work on coastal fisheries reform and critical habitat conservation in the region. In late January, Rare in Indonesia hosted the 2018 “Fish Forever Summit” in Wakatobi National Park (a Fish Forever field site). Staff from Indonesia, the Philippines, Mozambique, Brazil, and the United States were joined by Bloomberg Philanthropies’ Antha Williams (Head of Environment Programs) and Melissa Wright (Senior Associate, Environment Team) and Chuck Fox (Executive Director, Oceans 5) to review program results from the first phase of Fish Forever, celebrate successes, and discuss the program’s evolution. See Antha’s blog about the trip here. The Fish Forever Adaptive Fisheries Assessment and Management Toolkit, which guides managers and stakeholders through the process of assessing their fishery and creating an adaptive fishery management plan, is now published and available online. The toolkit—created by the University of California Santa Barbara-Sustainable Fisheries Group—has been tested at Fish Forever sites in Brazil, Indonesia, and the Philippines, and the publication includes a case study from Karimunjawa National Park, Indonesia (a Fish Forever field site). McDonald, Gavin, Stuart J. Campbell, Kendra Karr, Michaela Clemence, Pablo Granados-Dieseldorff, Raymond Jakub, Tasrif Kartawijaya et al. “An adaptive assessment and management toolkit for data-limited fisheries.” Ocean & Coastal Management 152 (2018): 100-119. In October, the Meloy Fund—an impact investment fund dedicated to promoting sustainable coastal fisheries in Indonesia and the Philippines—closed an additional $7M in investments from the Global Environment Fund and a prominent single-family office, Ceniarth, bringing the Fund to over $17M in committed capital. In the same month, the fund finalized a partial debt portfolio guarantee from USAID’s Development Credit Authority (DCA), and was also selected as the DCA’s “Innovative Deal of the Year” award and profiled on their “Exposure” website. Further, the Fund recently launched https://www.meloyfund.com/ to publicize the investment model and impacts to date, as well as serve as a confidential portal for investors to access key information and reports. The public side of the site features version 2.0 of the Fund’s Environmental and Social guidelines for investees, recently finalized after many months of consultations. Amano, Tatsuya, Tamás Székely, Brody Sandel, Szabolcs Nagy, Taej Mundkur, Tom Langendoen, Daniel Blanco, Candan U. Soykan, and William J. Sutherland. “Successful conservation of global waterbird populations depends on effective governance.” Nature (2017). This study determines that the strongest predictor of changes in waterbird abundance, and of conservation efforts having beneficial effects, is the effective governance of a country. The findings highlight that sociopolitical instability can lead to biodiversity loss and undermine the benefit of existing conservation efforts, such as the expansion of protected area coverage. Karr, Kendra A., Rod Fujita, Ramon Carcamo, Lawrence Epstein, James R. Foley, José A. Fraire-Cervantes, Mauro Gongora et al. “Integrating Science-based Co-management, Partnerships, Participatory Processes and Stewardship Incentives to Improve the Performance of Small-scale Fisheries.” Frontiers in Marine Science 4 (2017): 345. This study provides evidence that implementing a participatory process to generate a scientific basis for fishery management (e.g., data collection, analysis, design) and to design management measures among stakeholders will increase the probability that small-scale fisheries will implement science-based management and improve their performance. This study shows that fisheries yield and persistence are negatively related, but that both objectives can be maximized simultaneously during planning. Importantly, they also show that local efforts to manage spiny lobster, the most economically valuable marine resource in the Caribbean, can result in locally accrued benefits, overcoming a major barrier to investing effort in the appropriate management of this species. This study underscores major challenges for regional coral-reef management initiatives that must be addressed with priority: (1) strengthening management of reserve networks across political or customary boundaries; and (2) achieving adequate population connectivity via larval dispersal to sustain reef-fish populations within these networks. Lester, Sarah E., Gavin McDonald, Michaela Clemence, Dawn T. Dougherty, and Cody S. Szuwalski. “Impacts of TURFs and marine reserves on fisheries and conservation goals: Theory, empirical evidence, and modeling.” Bulletin of Marine Science93, no. 1 (2017): 173-198. This study found that combining reserves with TURFs may be better able to balance fisheries and conservation goals relative to TURF-only systems.